Designing this surf boat has been on my to-do list for many years and I’m super stoked about the fact that it finally became a reality. Just about every paddler and wannabe paddler wants to surf on ocean waves, but the reality is that all surfkayaks and waveskis require pretty good skills to handle. Not only this, but not being able to roll puts a definite damper on the kayak surfing aspirations of many paddlers. On the other side of the kayak spectrum, the vast majority of sit-on-top kayaks (no rolling required) are not at all fun to surf. What I wanted to create is a sit-on-top surfkayak that is very easy to paddle and surf, but that has real performance characteristics so that experienced paddlers can have a blast too. 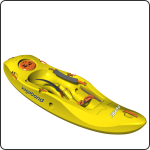 To be more precise, I wanted a sit-on-top that is so good at surfing that I’m happy to have it as my only personal surfkayak, but that is also so easy to paddle that I can put complete beginners on it without worrying about their safety. It took a few prototypes to find the perfect balance. I combined some design features that are normally not found together in one boat. I gave the hull a nice big planing surface for quick lift-off. The low stern rocker and square stern profile make the planing fast and stable. I gave it raised rails with soft bevels underneath that make it carve hard when you put it on edge, but that is super forgiving when going sideways on a wave. I gave it a lot of bow rocker for those badly-timed take-offs when catching waves. The hull surfs great without fins installed, but I also added fin boxes for those who want to add fins for more aggressive carving. What I did with the deck, however, is what really makes the boat so amazing. The seating position is both super comfortable and secure, holding you in place when punching through waves and edging the boat to carve. The thigh straps are positioned for maximum effectiveness, and rolling the boat is quite easy if you have a decent roll. I gave the stern huge volume, which makes the boat very stable in many different situations: punching through waves, surfing sideways, getting dumped by a wave from behind, etc. Another unique feature is the wave-piercing bow. It is pointy and buoyant and shaped to shed water very quickly. This makes the boat great for punching through waves when paddling for the back line. Like all the other sit-on-tops in the Vagabond lineup, I also added some big cutaways on the deck for smooth paddle strokes. I didn’t want to put scupper holes through the hull of the boat to drain water from the cockpit area, as this would negatively affect the surfing performance of the hull. It is important to drain the water somehow, otherwise you’ll be paddling in a bathtub as soon as you go through the first wave. So, I did something different, which works really really well: big drainage holes through the sidewalls. It drains the water in no time, and has no negative effect on the performance of the boat at all. For safety reasons, I gave the boat a bunch of handles, spaced in the most-likely positions where a swimmer may grab them to hold onto the boat. These same handles make it easier to get back on top too. Having spent quite a bit of time on the ocean with this boat myself, and also seeing the smiles of novice paddlers who tried surfing for the first time, I’m confident that the Dumbi will enable more paddlers to have more fun in the surf than ever before.